Mono with thin skin perimeter base is durable. Bleach knot in front provides a natural hairline. These hair pieces are available with different base sizes. Instant delivery. Lordhair’s MW1 stock men's hair replacement system is made with a fine mono top, thin skin perimeter, and super fine welded mono along the front hairline. The highly durable design of its base increases the hair system’s ability to last. Our MW1 stock Mono hair topper is breathable and easy to wear. High-quality mono top and thin perimeter make this hair replacement system super easy to clean and attach. Our MW1 stock mono hair system (topper) is cost-effective hair replacement system for people who want a breathable and durable hair piece. The freestyle nature of our stock hair gives you the flexibility to change your hairstyle as you please. This stock hairpiece comes in a variety of different base sizes. Also, we ensure immediate shipment after payment so that your men’s hair piece reaches your doorstep within 5 working days. 6''x8'', 6''x9'', 7''x9'',7''x10'', 8" x 10"
When you receive the order, if you find there is any problem or you are unhappy with the hairpiece, please do not have the unit cut, styled, colored or washed, but contact us instead. Lordhair customer servie will discuss with you and try to exchange a perfect one. Rest assured that we guarantee 30-day return if the hairpiece is not cut, styled, washed, colored or used. If this stock hairpiece doesn't meet your needs, you are welcome to customize a similar one by CLICKING HERE. 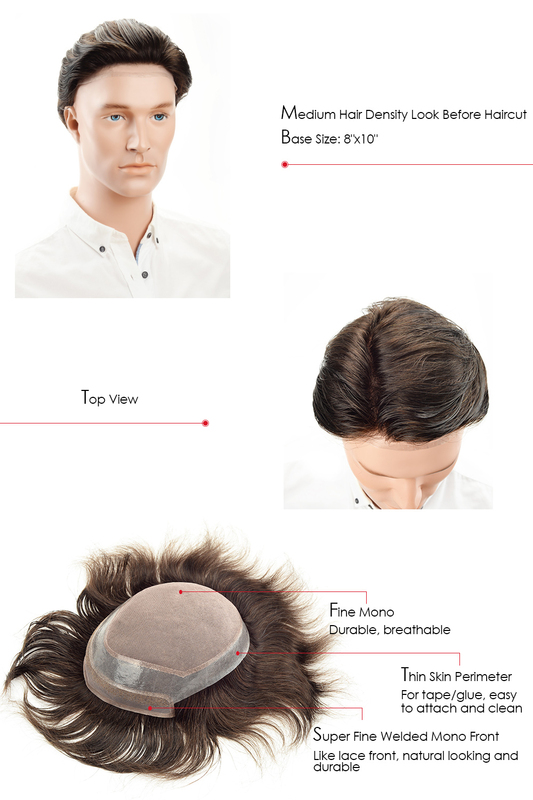 Besides top-quality non-surgical hair replacement systems, men’s hairpieces, and wigs, we also provide top-notch hair cutting and styling service with additional price of $20 USD. How long does the cut-in service take? Only 3 business days! You just need to send the pictures of hairstyle you like or choose one from the pictures below. If possible, please provide the hair length you would like with your mono thin skin hairpiece.